Long ignored as a tourist destination for it's shady past Colombia is finally taking its rightful place as the one of the most fascinating and beautiful countries in the world. Breath-taking natural landscapes of every type imaginable, quaint colonial towns, thriving modern cities, and people with a warmth and kindness that will instantly make you feel at home leave a lasting impression on anyone fortunate enough to visit this stunning country. As the only South American country with coasts on both the Atlantic and Pacific oceans its shores are home to a wide variety of marine life. The majestic hunchbacked whales migrate along the pacific coast while the caribbean coast abounds with colourful coral reefs and crystal blue waters. The interior of the country boasts everything from deserts to snow-capped mountains, jungles to glaciers. Given the overwhelmingly negative media coverage the country receives it is hardly surprising that most people dismiss Colombia out of hand when it comes to planning their next trip. I can understand this because I was also once of this mindset! If you're looking for a slightly more reasoned argument about the country being safe for visitors than "Trust me, it's great!" then have a look at my safety guide for more reassurance. The key is to speak to people who have actually visited the country. And I challenge you to find one of those people who doesn't rave about how wonderful the place is - it won't be easy! So jettison all those pre-conceptions you have about this country and give it a chance. I did, and I've now almost clocked up almost a decade here with no plans of leaving anytime soon! This is a country with a proud and traditional culture, but also one that is very inclusive - you'll constantly be encouraged to try the food, speak the language, and especially dance to the music! And barely a week passes without at least one festival, carnival or celebration of some description. Throw the nobel-prize winning Gabriel Garcial Marquez and a host of internationally-renowned artists like Fernando Botero and you have a country brimming with cultural heritage. Most South American countries consist of a huge capital city, often on the coast, with an under-developed hinterland. Colombia is different. There are 5 cities with populations of over a million people each with its own unique culture and charm. 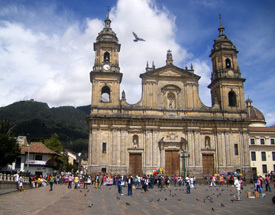 The sprawling capital, Bogota, is a city of towering skyscrapers and modern apartment blocks but also centuries-old colonial architecture. Then there's Medellin, known as the city of eternal spring as a nod to its year-round perfect climate and home to the impressive Flower Festival, and Cali, the Salsa capital of South America. Also worth a visit are large cities such as Bucaramanga, known for its numerous parks, and the Caribbean port of Barranquilla, famous for hosting the country's largest carnival. Cartagena features arguably the most stunning, colourful colonial quarter on the continent and is unmissable on any trip here. 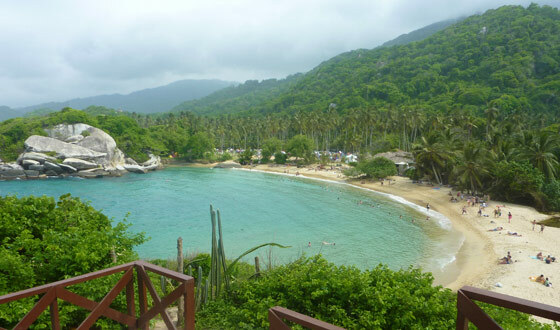 Not far from Santa Marta are the splendid beaches of Parque Tayrona where it's possible to stare at the snow-capped peaks of the Sierra Nevada de Santa Marta while floating in the warm waters of the Caribbean. The country abounds with quaint laid-back colonial towns dotted across the country's diverse canvas of landscapes. From the cool mountain towns of Villa de Leyva and Barichara to hot, sticky Mompox on an island in the middle of the Magdalena River. And don't miss the pretty town of Salento, the base for exploring the coffee region and for great treks into the surrounding forests and mountains. So whether you are planning to visit for business, pleasure, or both, prepare yourself to be amazed by everything this wonderful country has to offer.